Spaceflight Now spoke with Elon Musk, the father of SpaceX and chief designer of the Falcon and Dragon vehicles, on the eve of his company's biggest test yet. Musk established SpaceX in 2002 to revolutionize space travel, aiming to cut costs, boost reliability, and open spaceflight to the masses. So far, SpaceX has been successful in amassing a backlog of about 40 launches worth about $4 billion. The flights are for a mix of commercial and government customers, and the manifest is dominated by launches for NASA and Iridium, a mobile communications satellite operator. Musk was a co-founder of PayPal and Zip2. Since then, he has founded and led SpaceX and Tesla Motors, a growing electric car maker. He spoke with Spaceflight Now on Friday, less than 24 hours before his company's Falcon 9 rocket and Dragon spacecraft were scheduled to take off for the International Space Station. The flight is a crucial demonstration for SpaceX, which holds a NASA contract to deliver cargo to the space station. SpaceX is competing for government funding to eventually carry crews. 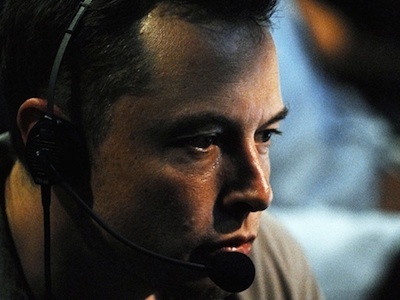 Musk will be stationed at SpaceX's control center at company headquarters in Hawthorne, Calif. Question: How nervous are you on the eve of launch? Musk: I feel pretty calm, believe it or not. Question: How do you think you will feel tomorrow morning? Musk: [Laughter] Either really happy or really sad. It's just one of those things that has a bimodal outcome. Question: Do you feel different before this launch than you did before Flight 1 or Flight 2? Musk: I think I feel a little more at ease than Flight 1 and Flight 2. In the case of Flight 1, that was the first time we were launching Falcon 9. And when we were developing Falcon 1, the first three flights failed to reach orbit. Fortunately, we learned our lesson there with Falcon 9 and we were able to reach orbit the first time. But given how difficult it was to reach orbit with Falcon 1, I was very on edge for Falcon 9. And then the second flight was the first flight of Dragon. We had never flown a spacecraft before, let alone recovered one from orbit. So there was a lot that could go wrong there. This time, we've flown the rocket twice and the spacecraft once, so the big question mark is really around the docking system. So I'll probably feel a bit more worried when Dragon approaches space station, which is three days from now. Question: So the rendezvous will be the point that gives you the most pause? Musk: Yeah. Maximum pucker factor occurs during the docking phase. Question: Can you define success for this mission? Musk: If the rocket gets to orbit again, that's three in a row for Falcon 9, and that's a huge success for Falcon 9. Then we move to the spacecraft part of things. The first thing we want to do is deploy the solar arrays and make sure those work. We didn't have solar arrays on the first Dragon mission. We'll make sure the solar arrays work and all the new avionics work, then the next level of success will be completing the COTS 2 objectives, which are establishing a communications link with the space station, get the docking sensors locked on to the space station, and do a wide loop around the station. Those are the COTS 2 objectives, which is a flyby. And then another success will be to go in and connect to the space station and transfer cargo. Question: Will you be able to get any sleep before launch? Musk: Launch is at 1:55 a.m. California time, so I'll be following along and then seeing how Dragon is performing on-orbit. We'll have a press conference a couple hours after launch, and then I'll probably get some sleep some time around late morning tomorrow. Question: When does mission control in Hawthorne take control after launch? Musk: We take over when Dragon separates from Falcon 9. It's pretty soon, just 10 minutes after liftoff. Question: How many people are in your control center? Musk: At launch control, we've got about 20 people or so. And we've probably got 30 at mission control in Hawthorne. But this is a special mission. This is the first time we're going to be going to the space station. We wouldn't ordinarily have 50 people on console for a mission. In the long term, we expect to reduce that number. Question: Can you describe what modifications you're making to the launch pad at Cape Canaveral? Musk: The extension to the existing hangar is for payload processing and it's also for Falcon 9 version 1.1, which is longer. It's about 50 percent longer than version 1. We need a little bit of extra length and some extra facilities for the satellites that are coming. Question: When will the first Falcon 9 v1.1 fly? Musk: We'll certainly be vertical on the pad at Vandenberg [Air Force Base in California] by the end of the year. Launch could be early next year. The launch date depends on how the final phase of testing goes for the next-generation Falcon 9. Question: What payloads will fly on Falcon 9 v1.1? Musk: The next version of Falcon 9 will be used for everything. The last flight of version 1.0 will be Flight 5. All future missions after Flight 5 will be v1.1. We've got this mission, which is Flight 3. And we've two CRS [Commercial Resupply Services] missions, Flight 4 and Flight 5, which will fly Version 1.0. Then all future missions, CRS or otherwise, will fly Version 1.1. Question: How many employees are you at now? Musk: A little more than 1,800. Question: As your business expands with potential crew flights, reusability, flyback and vertical landing of Falcon stages, trips to Mars, etc., do you foresee accelerating hiring? Musk: We expect to continue hiring at a high rate at SpaceX. We've grown on average about 30 percent a year. We might not continue growing at that level, but I expect to continue growing at 15 percent or 20 percent per year. We'll be hiring hundreds of employees every year. That's my expectation. Question: You believe that hiring rate will be sufficient for your business? Question: What missions will you be doing in 10 years? Musk: Our goal is to revolutionize space transport. So we'll be doing every kind of space transport, except for suborbital. We'll launch satellites of all shapes and sizes, servicing the space station with cargo and crew, and then the long term objective is to develop a space transport system that will enable humanity to become a multi-planet species. Question: When do you expect a first manned flight to Mars? Musk: I think it's probably around 15 years from now. I think the best case is 10 years, and the worst case is 20 years. Question: Will that be a SpaceX mission, a NASA mission, or led by someone else? Musk: I have no idea. Question: Do you want it to be a SpaceX mission? Musk: I would want it to be a joint mission. My ideal would be if we were going to Mars, it would be with NASA. Question: When do you plan a SpaceX IPO? Musk: I think the important thing for SpaceX is that we have a very steady cadence of launches and that we have very good predictability. The market hates unpredictability and punishes you severely for that. We need to be doing a launch a month before we go public, and we might be there by the end of next year. We're not aiming for a date. We'll go public when it makes sense for the company to go public.